Provide comfort for the family of Evelyn Ferguson with a meaningful gesture of sympathy. 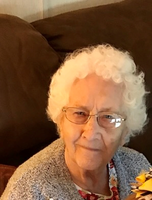 Evelyn B. Ferguson, 85, of Stephenville, died Sunday, March 31, 2019 in Stephenville. Funeral services will be held at 10:30 AM Friday, April 5th at Stephenville Funeral Home Chapel with Werth Mayes officiating, with burial to follow at West End Cemetery. Visitation will be 6:00 PM to 8:00 PM Thursday at Stephenville Funeral Home. Evelyn was born on November 4, 1933 in Berlin, Germany to the late Ignaz and Hedwig Heinemann Kaufmann. She married Calvin D. ‘Cal’ Ferguson on May 16, 1959 in Stephenville. Cal preceded her in death on July 22, 2005. Evelyn was member of the Catholic faith, a homemaker, and has lived in Stephenville since 1977. Evelyn is survived by her sons, Thomas Ferguson of Stephenville, Jerry Ferguson of Whitney, Glenn Ferguson of Stephenville, and Alan and wife Tammie Ferguson of Stephenville; grandchildren, Steven, Taylor, Nicholas, and Cody Ferguson, and Tawnni Moss; great grandchildren, Kylie, Jayden, Kaylynn, Hunter, Kole, Asher, Quinsleigh, Benjamin, and Brooklynn. To send flowers in memory of Evelyn Ferguson (Kaufman), please visit our Heartfelt Sympathies Store. Provide comfort for the family of Evelyn Ferguson (Kaufman) by sending flowers. Evelyn will be missed, it was always a treat to hear a story from her.